A wholesome, naturally gluten-free version of the perennial favorite quick bread, these light and fluffy pancakes incorporate heart-healthy oat flour (or oats) and can be prepared as waffles, too. Sometimes we just need a stick-to-our-ribs breakfast – and, happily, we can have it in a deliciously wholesome way! The first banana bread I ever made was this slow baked version. The recipe caught my eye when I was barely out of college. Even then I appreciated a good kitchen experiment, and the 250℉ oven temperature caught my eye. Lately, I’ve been working on a loaf that’s sweetened entirely by overripe bananas. I’m excited about that recipe, too. Stay tuned! But why not enjoy the classic banana bread flavor in other ways, too? I’ve cooked countless batches of the following banana bread pancakes and waffles, both for every day breakfasts and holidays brunches. 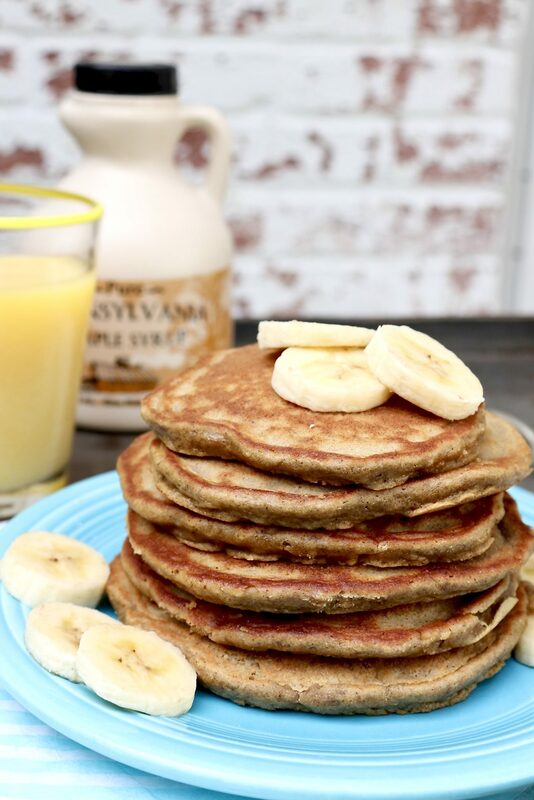 The wholesome recipe is an ideal way to use brown, past-their-prime bananas, which provide more natural sweetness than vibrant yellow, perfect-for-eating bananas. Often, I prepare a big batch of these pancakes in the afternoon and let them cool. Then I freeze a portion and refrigerate the rest for easy breakfasts over the week ahead. Of course, a drizzle of maple syrup is the traditional way to enjoy pancakes, but we have a few other favorite toppings. Note that the natural sweetness and great flavor in these pancakes makes a little syrup go a long way. (This from a person who can use pancakes as a sponge for good maple syrup!) When I do use syrup, I dip each bite into a puddle of syrup on my plate, which cuts down on sugar consumption without sacrificing flavor. But what about those other toppings? 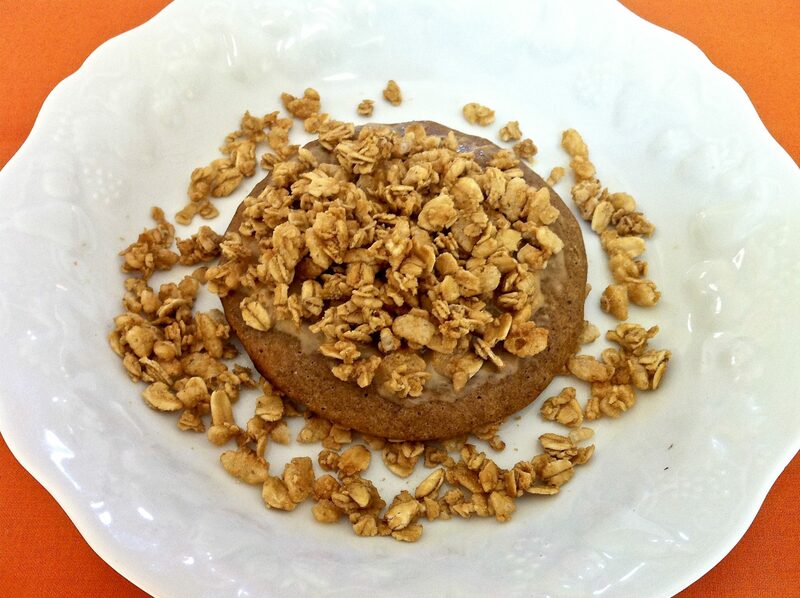 One of my very favorite ways to eat pancakes is to spread them with peanut butter and press them into a shallow bowl of granola. Eaten this way, one or two pancakes make a satisfying meal that supplies a wholesome balance of whole grains, filling protein and healthy fats. You could use almond or your favorite nut or seed butter in place of the peanut butter, or you could sprinkle the granola over top. The pressing method simply coats and makes the granola adhere a little better. Either way, you shift the carb-to-protein ratio, stay full longer and end up with pancakes that can be eaten like toast. They’re creamy, crunchy, salty, sweet and so very satisfying. And they’re fun! To give you a visual, I looked for some photos and found these two－from 2012! The top one incorporates my homemade Bisquick, while the bottom photo shows a grain-free baked pumpkin pancake. Though not shown in these photos, I often top with banana slices. Optionally, a sprinkle of raisins offers an extra hint of natural sweetness for those who enjoy them. My sons enjoy the peanut butter-granola topping as much as the customary drizzle of maple syrup, but they are equally delighted by a thin spread of Nutella. Though Nutella may not seem like the healthiest alternative, I find that they are satisfied with fewer pancakes (2-3, with a banana or other serving of fruit as opposed to a stack or two) when eating this way. Also, based on the amount of syrup they tend to use, I’m certain that the thin spread of Nutella delivers far less sugar. As I note in the recipe, the thick batter lends itself well to waffles, too. 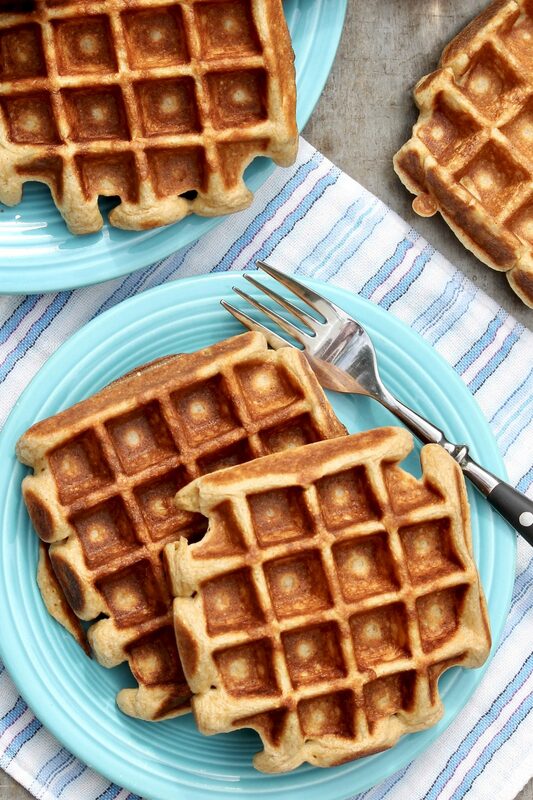 The moisture-rich bananas make for a slightly less crisp waffle than a traditional batter does, but they’ve still garnered rave reviews whenever I make them. For those who don’t have a waffle iron and may be considering a purchase, a waffle iron actually cooks a batch faster and with little monitoring. The model we have chirps like a bird when the waffles are cooked to golden brown perfection. Really ripe bananas lend natural sweetness and, combined with the oats, a flavor and tenderness that is reminiscent of a slice of your favorite banana bread. I like to add two tablespoons of maple syrup to the batter, which results in a pancake that tastes good enough to eat as is－although a light drizzle of pure maple syrup sure tastes good! 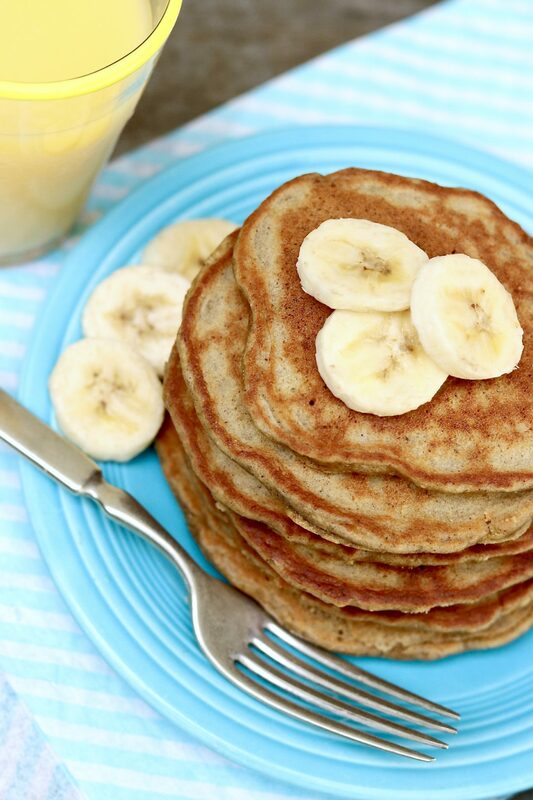 These fluffy banana oat pancakes are a deliciously healthy, naturally sweetened breakfast for lazy mornings. The recipe is made with 100% oat flour instead of wheat flour, so it’s gluten free, as well as dairy free if using the coconut oil option. A wholesome, naturally gluten-free version of the much-loved quick bread, these light and fluffy pancakes incorporate heart-healthy oat flour or blended oats. In a mixing bowl, stir together the mashed bananas, coconut oil or butter, lemon juice and maple syrup. Add the oat flour, baking soda, salt and spices, stirring just until the dry ingredients are thoroughly moistened. Let the batter rest on the counter for 10 minutes. If the batter seems very thick at this point, you may fold in milk or water, a tablespoon at a time, until loosened—the batter should still be quite thick. Heat a heavy cast iron skillet or non-stick pan over medium-low heat, or heat an electric griddle to 350℉. Lightly oil the surface with coconut oil, butter or cooking spray. Once the surface of the pan is hot enough that a drop of water sizzles on it, pour scant ¼ cupfuls of batter onto the pan. Let the pancakes cook for about 3 minutes, until bubbles begin to form around the edges and the undersides are golden. Flip the pancakes with a spatula and cook for another 1½ to 2 minutes, or until golden brown on both sides. You may need to adjust the heat up or down at this point. *To make your own oat flour: Pour quick or old-fashioned oats into a food processor or blender and process until ground into a flour. For one cup of oat flour, you’ll need to start with approximately 1½ cups of oats to measure 1 cup (120 grams) of oat flour. 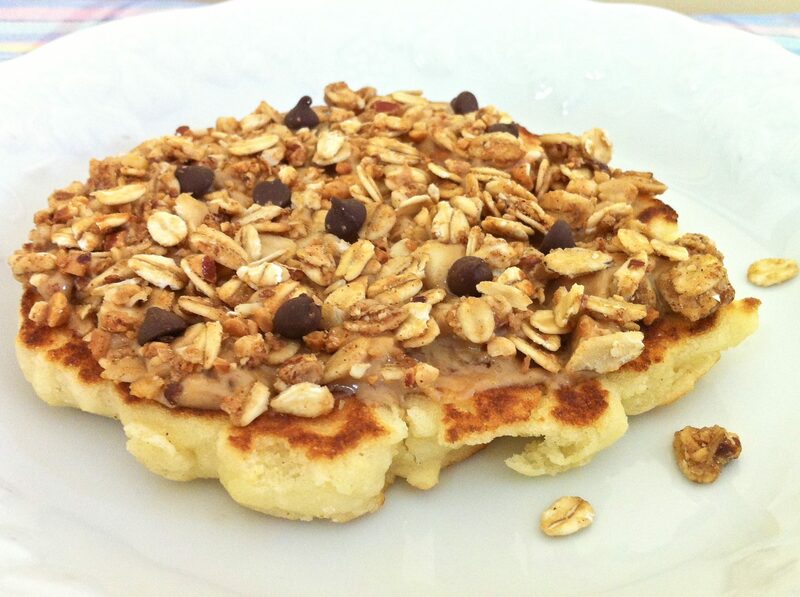 For gluten-free pancakes: Use certified gluten-free oat flour or oats. 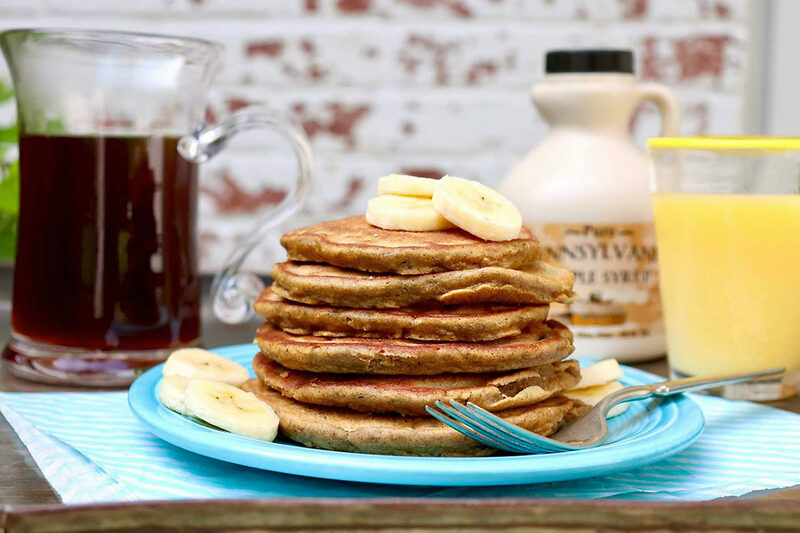 For dairy-free pancakes: Use the coconut oil option instead of butter. Cooking tip: This whole grain batter is thick, so it can be difficult to gauge when the pancakes are ready to flip. You may wish to set a timer for 3 minutes for the first side, then flip and wait another 2 minutes to cook through. The time will vary depending on the precise cooking temperature, but this is a good estimate for fully cooked pancakes that are golden on each side and can be adjusted as needed. Advance prep: The batter may be mixed several hours in advance and then covered and refrigerated until ready to cook. In this case, you will likely need to add a few tablespoons of milk (or water) to thin. For thick pancakes, however, be sure to keep the batter thick. To make waffles: The thick batter makes great waffles. Spray the waffle iron for easy release and cook according to the manufacturer’s directions. Recipe adapted from King Arthur Flour Whole Grain Baking by way of Cookie and Kate. It’s completely satisfying. You must try, Alexis! Another keeper! Ann, these are yummy. I admit to being too lazy this morning to drag out the blender and grind up the oats so I used regular unbleached flour. Otherwise, I stayed true to the recipe, including the fresh nutmeg. I never realized what a difference it could make. I ate them bare, without butter or syrup and there were sweet and delicious! A helpful hint, your stove top temperature should be set lower than usual or your pancakes will scorch. I am guessing the added sugars in bananas and syrup are the cause. PS I miss you in the newspaper, but I am happy when your email shows up in my inbox. Thank you very much for the thoughtful comment, Trudy! I am delighted these were a success and glad you found them to be delicious without added syrup. Also, I appreciate your feedback regarding the stove temperature as well as the newspaper. I am still missing that lovely connection with the LNP readers myself!